Hanoi (VNA) – Politburo member and head of the Party Central Committee’s Mass Mobilisation Commission Truong Thi Mai has lauded the Soong Ching Ling Foundation and its Chairman Wang Jiarui for their contribution to the friendship between Vietnam and China’s parties, countries, and people over the past years. During a reception in Hanoi on April 2 for Chairman Wang, Mai expressed her delight at the substantial development of Vietnam-China ties across the fields from economy, trade, tourism, and people-to-people exchange. 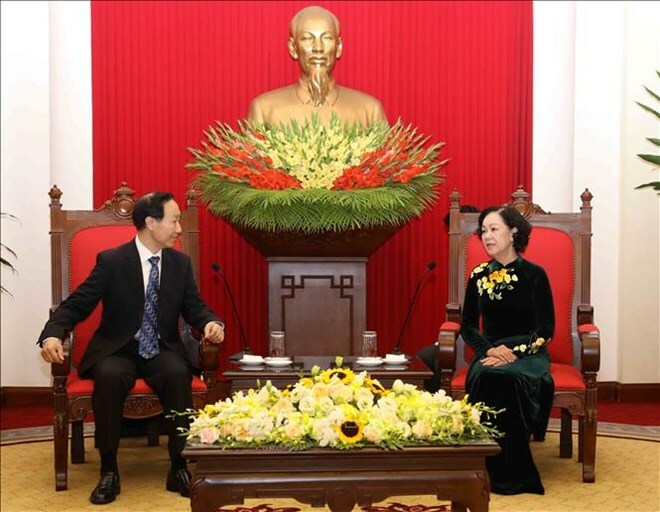 She expressed her wish that the foundation would expand collaboration with Vietnamese partners, hold more people-to-people exchange activities, especially those for young people, for the two countries to raise mutual understanding and educate younger generations about the special relations between the two parties, countries, and peoples. Wang, for his part, believed that bilateral ties would keep growing.